The Duthie Customer Portal is a great tool for you to use to streamline your needs with Duthie Power Services. Our web based portal allows our customers to view their equipment and site information as well as review invoices and quotes. It can be accessed right through our website www.duthiepower.com. In the top right corner, there is a button for Customer Login. The User ID and Password is provided by Duthie Power for each of our new clients. You will find this login information in your welcome letter. If you are an existing Duthie Power Services customer, and this is something you would like to utilize, please contact us to be set up. Our example utilizes one of our customers that has over 900 sites giving you an idea of how everything is laid out. Under Sites and Equipment, you can view all of the individual sites and all of the equipment under each corresponding site. Another tab option is the Service Calls. You can see open work orders, completed work orders and billed work orders. Again, the example used is one of our larger customers. Once the work has been completed, and the technician completes the report, it will fall under the completed work orders tab, and once it is billed, it will fall under the billed work orders tab. 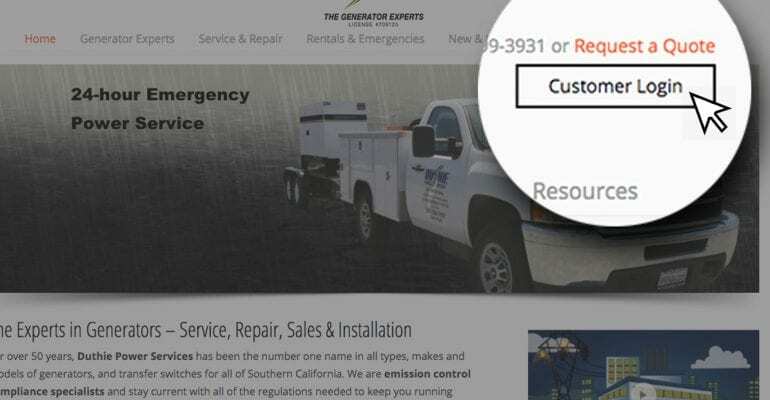 If you would like to request service straight from the portal, that is an option under the Request Service tab. The request just needs to be site specific. If there is a new site that has not been added into our system, then there is an option to add in a new site. Anytime Service is requested through the portal, there will only be 4 choices of work. Generator Deployment, Emergency Service, Equipment Refueling, and Service. We always need a purchase order, and lastly if Emergency Service is selected, we will need to know what the issue is. You can also view your quotes through the portal. All new quotes you can open, review and approve or decline. There is also an option to send an email as well if you have questions. One of the other options on our portal is the Billing Summary. Here you can view any open invoices, and get any to your accounting department if that is a need. You can also view past invoices under the Billed Equipment Tab. This portal is something that all new customers are automatically set up with. If you are an existing customer and would like to be set up on this portal, please contact your Sales Representative, or Corinne Rodriguez. For more information on our portal watch the video above, or just give us a call at 1-800-899-3931 to discuss in more detail about how our customer portal can help you.